Former FBI Director James Comey said Sunday night he hopes President Trump is not impeached because he believes it would let citizens "off the hook." 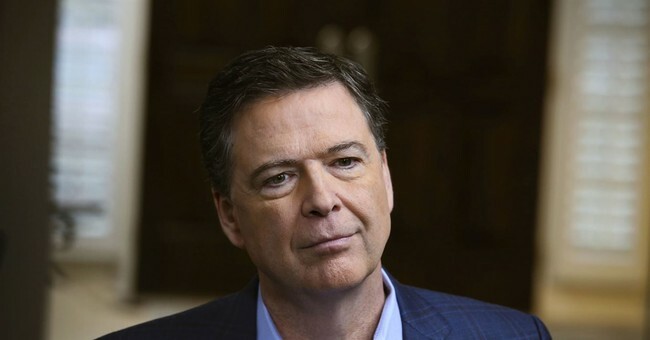 "I think impeaching and removing Donald Trump from office would let the American people off the hook and have something happen indirectly that I believe they're duty bound to do directly," Comey said in an interview with ABC's George Stephanopoulos. He said special counsel Robert Mueller should continue his investigation into Russian meddling in the 2016 election, but added that he thinks Americans should be forced to reexamine their core values instead of fighting over political issues. "People in this country need to stand up and go to the voting booth and vote their values," Comey said, saying impeachment "in a way, would short-circuit that." Yeah, that’s rich. So, having a serial liar as your top deputy is part of that code of ethics, sir. Andrew McCabe was axed hours before he was set to obtain a multi-million dollar pension. He was fired because the DOJ inspector general sashimi’d him for lying multiple times, three of those times was under oath. One of those lies, relating to the unauthorized leak he quarterbacked to The Wall Street Journal about the friction between the FBI and DOJ over the Clinton Foundation probe, he set off a manhunt for a mole within the department that started and ended with him. He was rightfully fired. So, if we’re going to start with standing up for values, we need to clean house at the FBI first it would seem. Disagree if you want, but it seems to me Comey made a mistake communicating about an investigation one summer, made things worse by doing it again, and now hopes the cure is to do it again —doesn't excuse Trump's deeds, but I'm not excited about the $1000-admission-fee-book-tour. If Comey's decision to release the letter on Oct. 28 was influenced by his interpretation of the polls, that really ought to cut against his image as an honorable, principled decision-maker. Instead, he was just being expedient and trying to save his own hide. UPDATE: As for Comey’s allegation that he found information that would have been damaged the credibility of former AG Loretta Lynch in the email probe, Lynch responded: you’re full of it. Comey writes in the book that he found evidence which he felt could cast "serious doubt" on Lynch's independence. "Had it become public, the unverified material would undoubtedly have been used by political opponents to cast serious doubt on the attorney general's independence in connection with the Clinton investigation," Comey writes. He calls the material a "development still unknown to the American public to this day."